By Scott Gilfoid: British heavyweight Dillian Whyte (16-1, 13 KOs) has finally got an opponent for his fight this Saturday night on the undercard of the Anthony Joshua vs. Dominic Breazeale card on June 25 at the O2 Arena in London, UK. 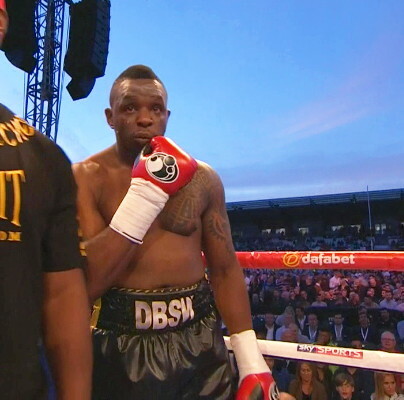 Whyte, 28, will be facing 39-year-old American journeyman Danny Batchelder (31-11-1, 15 KOs) in an eight round fight. It’s unclear why Whyte is fighting an American fighter and not a local British heavyweight, but it’s possible that this is a move done by Whyte’s promoter Eddie Hearn to make it a more appealing fight for American audiences. The Joshua-Whyte card is supposed to be piped into the U.S on Showtime Boxing. Whether the Whyte-Batchelder fight makes it onto the televised portion of the Showtime card is unclear. I wouldn’t be surprised if the Whyte vs. Bachelder fight doesn’t get televised on the Sky Box Office pay-per-view portion of the card, because Hearn has stacked the card with a lot of name fighters in arguably far better matches than Whyte’s. This is Whyte’s first fight since undergoing shoulder surgery on his left shoulder last year. That would explain why he’s fighting a journeyman rather than a top contender. Before Whyte injured his shoulder, he was fighting at a very high level and looking like someone that would give Joshua his first loss of his career. Whyte gave a really good effort in his fight against Joshua last December in fighting with one arm from the 2nd round. Whyte staggered Joshua in round two, but then injured his shoulder in the process. We’ll never know what would have happened if Whyte’s shoulder had held up. All we know is Joshua was staggered around after getting clipped by Whyte. You can call it a miracle of whatever that Joshua wasn’t knocked out by Whyte, because if not for that injury happening at the exact same time that Whyte hurt him, we could have seen Joshua tasting defeat for the first time in his career. Batchelder has lost his last two fights by knockout to Johnnie White and Jon Bolden in 2015. Those aren’t well known fighters, and it kind of gives you a good indication of Batchelder’s talent level or lack thereof. Batchelder hasn’t fought yet in 2016. Batchelder has fought – and lost – to a number of high profile fighters in the past like Matt Godfey, Kubrat Pulev, Lance Whitaker, Lamon Brewster, James Toney, Alexander Dimitrenko, Brian Minto, Charles Davis and Eric Fields. Whyte was supposed to be facing Cyril Leonet of France, but he couldn’t take the fight and Batchelder was brought in to replace him. This fight should give an indication of where Whyte’s left shoulder is in terms of whether he can generate power with it after his surgery. Hopefully, it’s 100 percent so that he can start stepping it up against better opposition. Whyte would like to fight a rematch against Joshua while 100 percent healthy. It’s a doable fight in the future if Whyte can come all the way back from his shoulder surgery. Whyte would be better to take it easy in his fight against Batchelder and not try and destroy the guy. When you’re coming off a shoulder injury, you don’t to push things too fast because there’s always a risk for another injury.